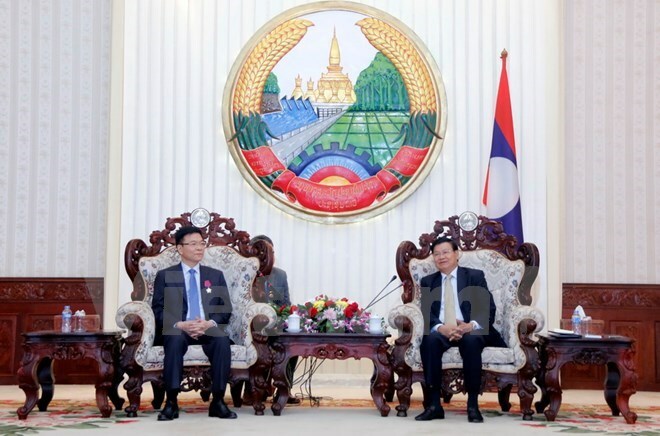 Lao Prime Minister Thongloun Sisoulith in Vientiane on November 28 received Viet Nam’s Minister of Justice Le Thanh Long. At the reception,Minister Long said the legal and judicial cooperative relations between Viet Nam and Laos and particularly the justice ministries have been growing over the past 35 years thanks to regular experience exchanges in law building and enforcement, training, and encouragement of cooperation between judicial institutions at localities. The Vietnamese Ministry of Justice is willing to support Laos to build and improve the legal system as well as train human resources, he added. The same day, the two sides celebrated the 35th anniversary of bilateral judicial cooperation. Lao Minister of JusticeSayxiSantivongsaid the Vietnamese counterpart has actively supported Laos over the past few years via providing equipment for Lao judicial sector, sending experts to help Laos build legal curriculum and draft the first Constitution which took effect on August 15, 1991, and revise legal documents in politics, administrative procedures, economics-culture, and society. In turn,Lao PMThonglounSisoulithsaidLaos will work out measures to help Vietnamese people who want to apply for Lao citizenship complete procedures as quickly as possible and in line with the host’s legal regulations. The enhancement of bilateral cooperation between the two ministries of justice is of great importance given the increasing number of civil disputes, especially in the field of economics, and the development of the socialist-oriented market economy, he added. VietNam has experience in building and revising law while Laos has a lot of shortcomings in the field, he said, adding that he hoped the Vietnamese Ministry of Justice will increase experience sharing and assist Laos’s human resources training. On the occasion, the Vietnamese and Lao Parties and States granted Laos’ Freedom Order (Issala) and Viet Nam’s Independence Order to outstanding individuals and units of the two ministries./.